The precisely controlled laboratory high speed stirrers of the DISSOLVER 492 series are suitable to produce colloidal suspensions with very fine solid particles integrated by high speed into fluid, as well as for mixing and dispersing of mill feed material within common paint/lacquer matters (disintegration of clusters of powder-type components by shearing force during the dispersing procedure, to cover in ideal case their primary particles with the fluid phase). Software for rapid conversion between viscosity and efflux time, for use with standardized flow cups. Converts between dynamic and kinematic viscosity. Clearly arranged graphics, easy to use. For rapid conversion between different viscosity units (ASTM seconds, DIN seconds, cSt, Engler degrees, Krebs-Stormer units, Gardner-Holdt units) at defined temperatures (ICI Scale for the viscosity/temperature relationship). Rapid determination of the viscosity of any type of fluid, as for instance paint, varnish, wet enamel, photogravure ink, dye and lacquer for leather, oil, fat, foodstuff etc. Particularly suitable in the workshop. Simple Dip Flow Cup, available in five sizes as a set or individually. 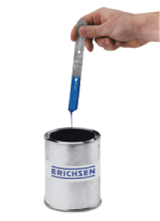 Well-known, handy instrument for quick and convenient establishment of viscosity, directly from the container, by simply dipping in and measuring run out time. Internal dimensions in accordance with DIN 53 211 (Model 321) and ISO 2431 (Model 322), respectively. Objective determination of flow time for viscosity measurements using standardised flow cups. Including temperature bath and adapter rings for the different flow cups. Automatic measuring sequence with optical detection of the efflux stream of sample. Flow times up to 200 s can be read off from the LCD with an accuracy of 0.01 s.
A flow viscometer conforming to international standards. Optional accessories: Adjustable tripod and thermostatically controlled jacket to ensure reproducible results; thermometer and digital stop watch with calibration certificate.